We now have 5,916 different mustards from all over the world. Our extensive collection of antique mustard tins – more than 400 – continues to grow as the Curator cannot resist buying them when he finds new ones. Here is the latest, a fine piece from the Van Ogden Company of Chicago. We know little about the company except that it was in business as late as 1945 when the Illinois Supreme Court found against it in an unemployment compensation case. Van Ogden, Inc. v Murphy, 390 Ill. 133, 60 N.E.2d 877 (1945). According to the court’s opinion, Van Ogden was in the business of selling cosmetics, extracts, spices, and more. However, Van Ogden didn’t think its salesmen were employees subject to the Illinois UC Law. Alas, no one escapes the reach of the Illinois UC Law. 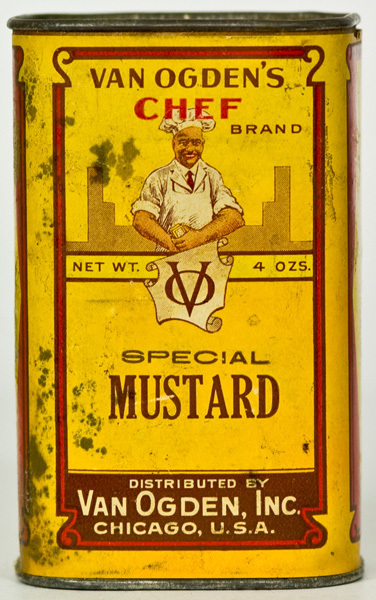 Will you help the Museum in its quest to acquire all things mustard? Your generous donation makes this all possible. The nonprofit National Mustard Museum is a 501(c)3 organization. Donations may be tax-deductible. Purchases of mustards and other items are not.